Growing in a pot or hanging basket gives a plant just the right soil for its needs. The pot or basket can be moved around to get just the right amount of sun or shade. The plant doesn’t have to compete with the roots of other plants, unless you choose to plant a group who will grow well together. 1. Make sure the pot has one or more holes for drainage. 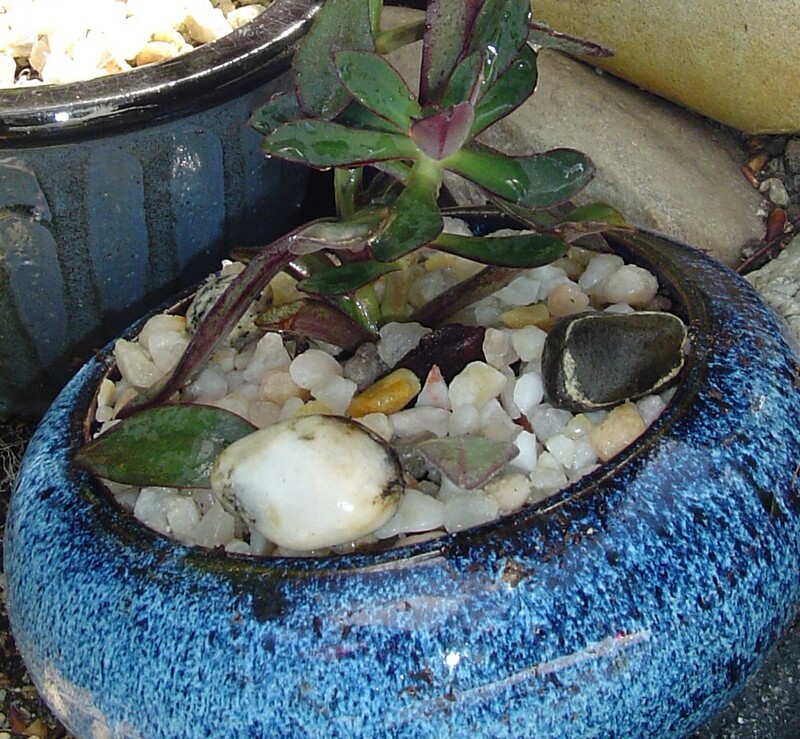 Without drainage, the plant will most likely drown when it rains, or if it is over watered. 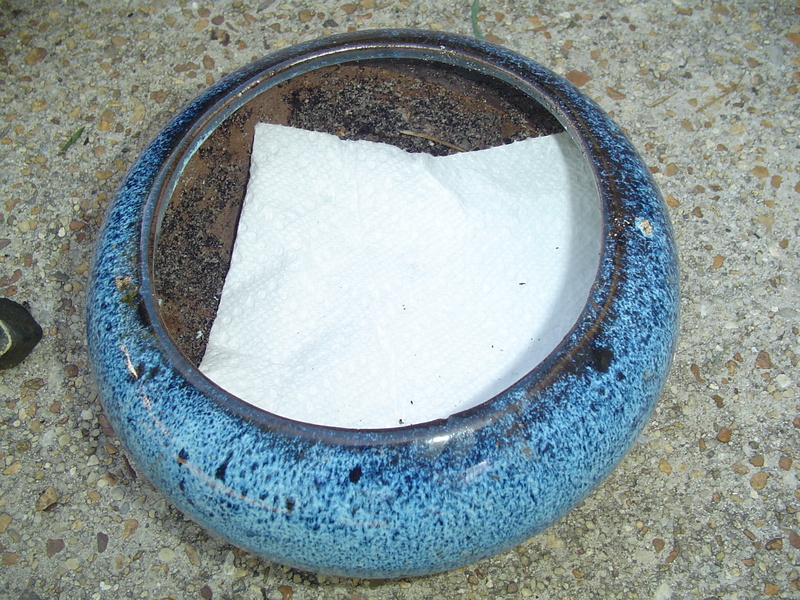 Cover the bottom of the empty pot with a piece of landscaping fabric or a paper towel. This holds the soil in the pot until the plants’ roots grow out to hold the soil. Landscape fabric will present a barrier to pill bugs and other creatures who want to climb in through the drainage hole to make a new home for themselves. The paper towel will absorb water, and then release it back to the soil as needed to help the soil stay evenly moist between waterings. Eventually, the paper will decompose. 2. I spread a shallow layer of gravel over the paper or landscape fabric. I believe this allows an extra margin for water to drain out of the soil, especially if the pot is outside during a rainy spell. 3. Partially fill the pot with fresh potting soil. I like a peat based mix which advertises that it will also feed the plants for the first few months. 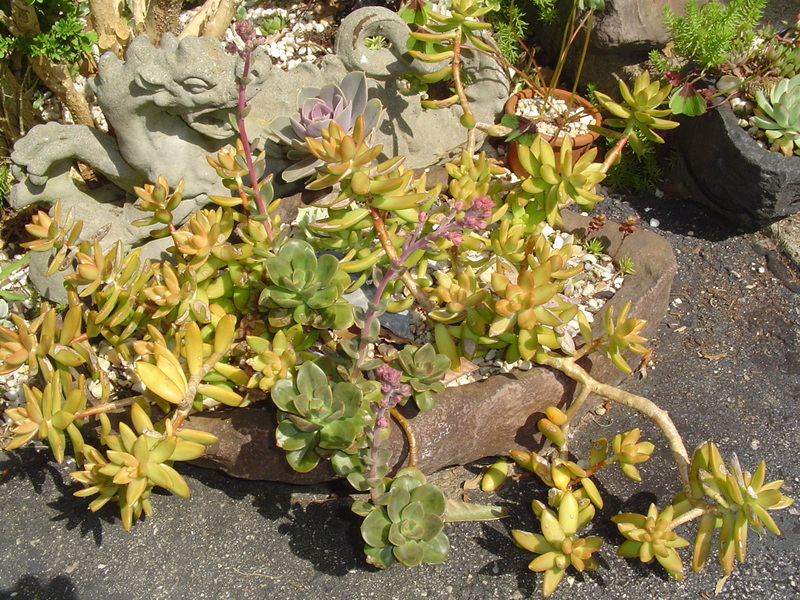 A little sand or gravel mixed with the soil improves drainage for succulents. A little compost can be mixed into the soil for vegetables. The soil should be moist, but not too wet. A plants’ roots need to breathe, especially in a pot. Dirt dug up in the yard will be too heavy and the plant will have difficulty. 4. Mix some fertilizer into the soil. I often use Espoma Plant Tone for flowering plants, or Tomato Tone for vegetable plants. This enriches the soil and feeds plants over the long term. Osmocote is a good short term fertilizer which will release nutrients at each watering for about four months. 5. Make a well in the center of the soil for the root ball of the new plant. 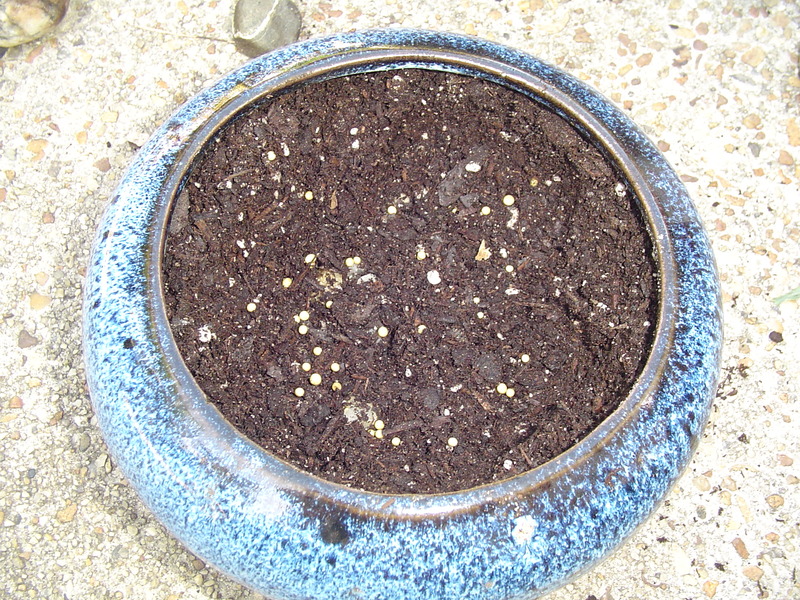 Push the fresh potting mix against the sides of the pot, especially if the pot has concave areas like this one does. 6. 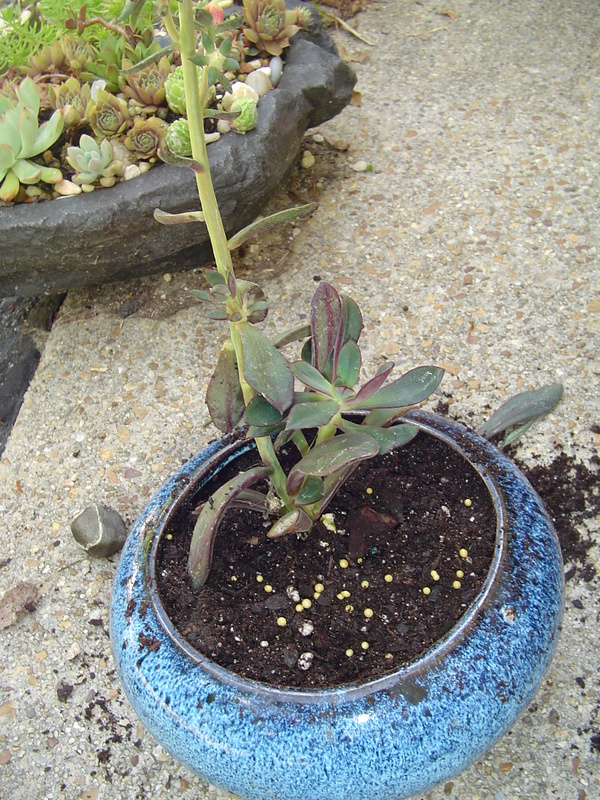 Remove the new plant from its nursery pot, loosen the roots slightly, and place into the new pot. Fill in with additional potting soil around the roots, tamping the soil gently until it is firm and all spaces are filled. Keep the plant at the same depth as it grew in the nursery pot, unless you know it will grow new roots along the stem like a tomato plant will. Some plants, especially shrubs or trees, will actually suffocate if you put too much soil over the root ball. Sprinkle some Osmocote onto the soil. 7. Top dress the soil with fine gravel or small bits of shell. The layer of gravel serves several purposes. First, it looks nice. It protects the plant from splashed soil during a rain, and protects the soil from erosion during a heavy rain or watering. Finally, it offers the plant some protection from slugs and snail, who don’t like the gravel, and from digging squirrels, who will be deterred from digging in the pot. 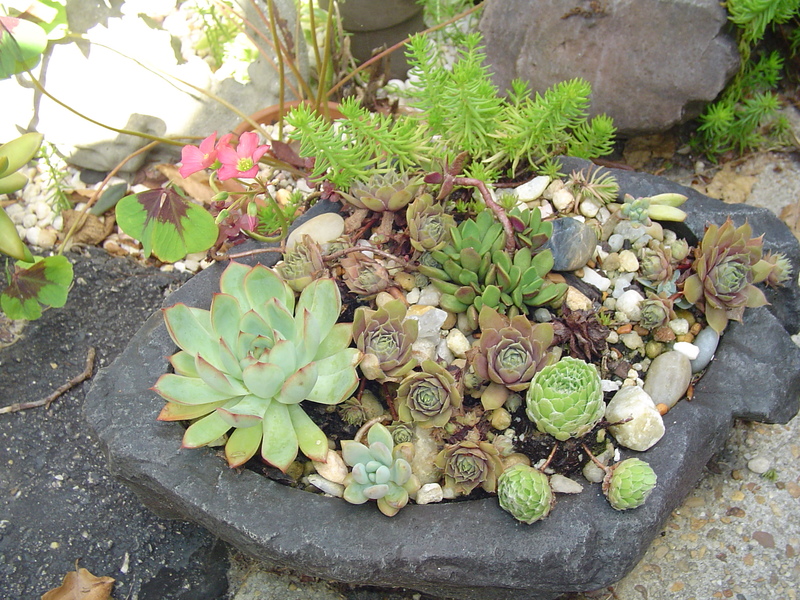 This Echeveria nodulosa is top dressed with pea gravel and stones picked up along a beach on the Puget Sound. This will protect the roots from digging squirrels, and will discourage slugs from eating the leaves. Echeveria leaves will root, and so those broken off during potting are stuck about 1/4 into the soil around the parent plant. 8. Water in the newly potted plant. I like to make a dilute solution of Neptune’s Harvest for the first watering to strengthen the plant and counteract any transplant shock. This first watering settles the soil around the roots of the plant and helps prevent any air pockets which could allow the roots to dry out. Place most plants in a shady area for a day or so to let their roots adjust before moving into a sunnier spot. 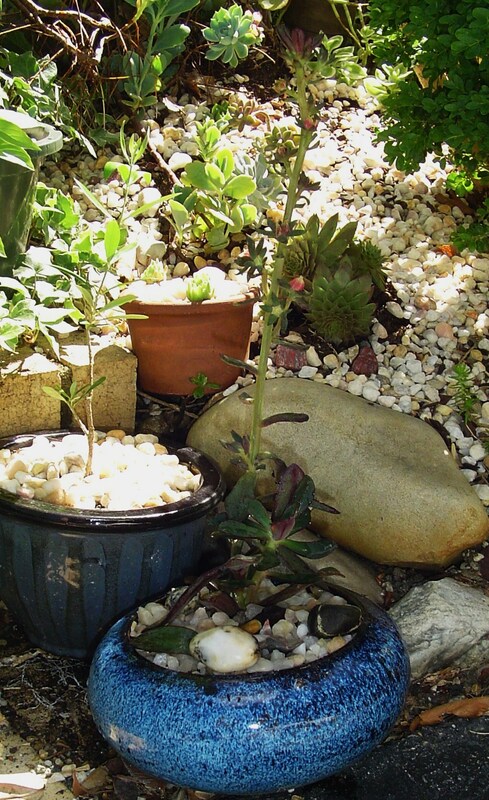 This Echeveria nodulosa is a succulent, which enjoys the heat of full sun, and so it has gone to its new permanent spot in the garden. 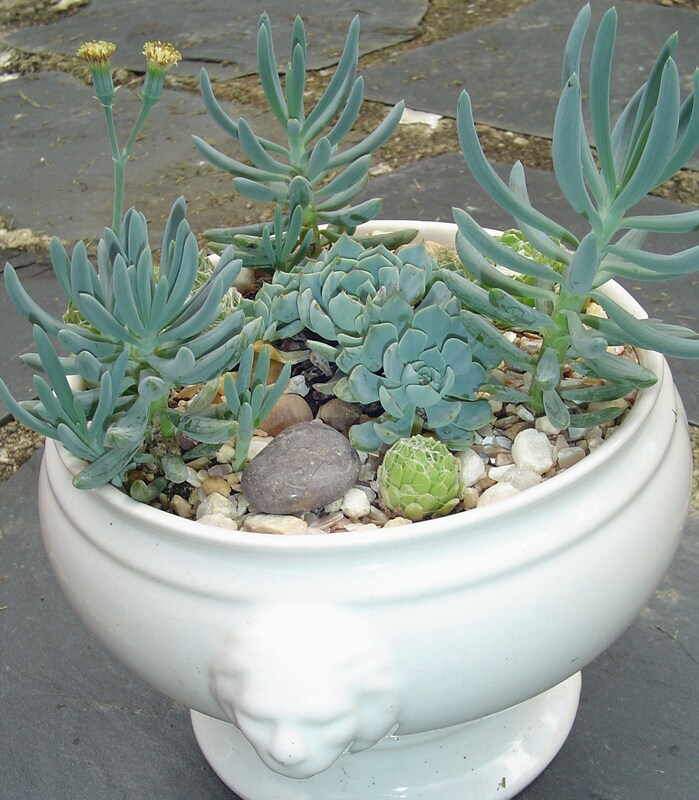 These succulents live in a pot with no drainage. 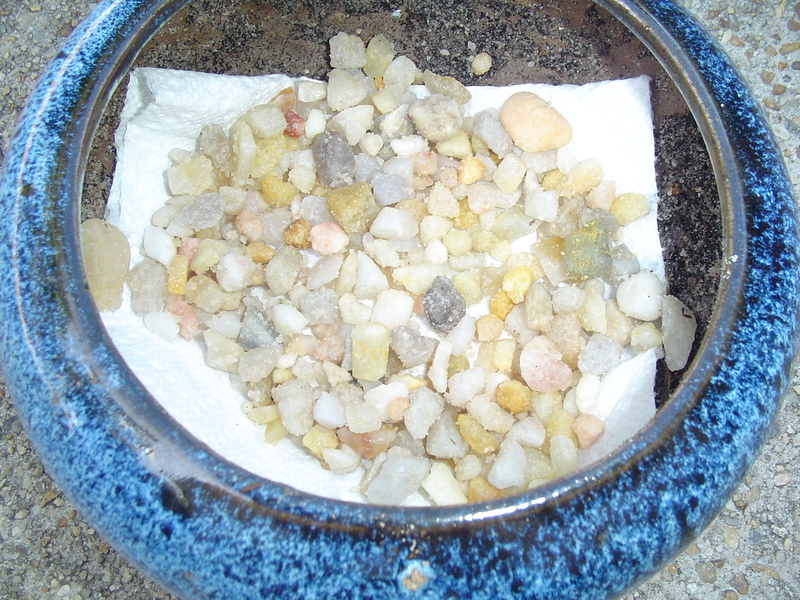 There are two inches of gravel in the bottom of the pot. It is watered sparingly and kept sheltered from the rain. Plants growing in pots don’t have the same available nutrients as plants growing into deep Earth out in the garden. They rely on the gardener for care and feeding. I use a multi-layered approach to feeding by enriching the soil as a plant is potted, top-dressing with a slow release fertilizer, and also feeding with a diluted fish emulsion and seaweed fertilizer every few weeks when the plant is actively growing. Each of these products approaches feeding in a slightly different way. Espoma http://www.espoma.com/ I use Rose Tone and Holly Tone out in the garden and Plant Tone and Tomato Tone both in the garden and when potting up. love your site and the step by step instructions.